When organizations have a "World-Class" sales process (the top tier of our 5-level sales process maturity level scale), the win rate from proposal averages 57%. When the sales process is merely "Defined," the win rate averages just 44%. Getting your sales process right, and knowing it inside and out, is essential if you want to bring in wins consistently. 80% of Elite Performers (the top 7% of respondents to our research study) have sellers who are deeply knowledgeable about their company's sales best practices. Only 34% of The Rest do. To facilitate the sale successfully, you also need to understand the buying process and how it works. 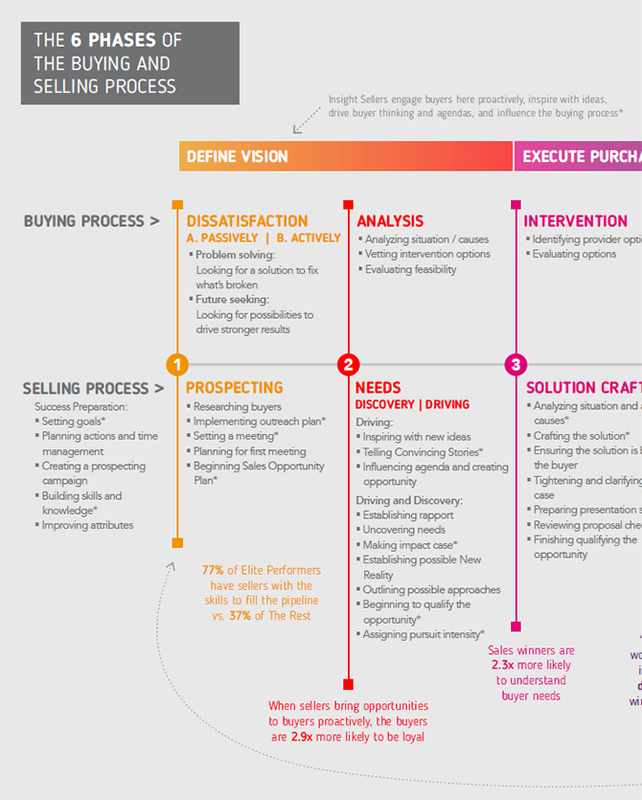 See the graphic below for a 6-phase framework connecting the selling process with the buying process. Click to enlarge and view the full PDF.